Laser therapy provides a sterile, pain-free, surgery-free, drug-free treatment which is used to treat a variety of injuries, wounds, fractures,neurological conditions, numerous dermatological problems, and pain. Whether your pet is rehabilitating from trauma or injury, healing from wounds, or simply aging, your companion will benefit from this revolutionary new approach to Veterinary medicine. Laser therapy is the only course of treatment that actually stimulates the body to heal from within. Non-thermal photons of light are administered to the body and absorbed by the injured cells. The cells are then stimulated and respond with a higher rate of metabolism. This results in increased circulation from the body, an anti-inflammatory reaction, relief from pain and an acceleration of the healing process. It is important to remember, however, that laser therapy is not entirely curative and is meant to supplement the healing process. As a pet owner, it is reasonable for you to feel apprehensive toward theoretically painful treatment for your pet. Laser therapy offers an entirely pain free solution; and, studies show laser therapy to have absolutely zero side-effects. We are pleased to offer our patients this form of therapy as an alternative method of treatment. 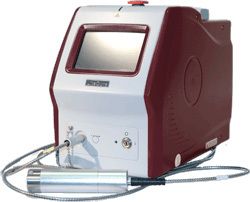 Laser therapy, also called cold laser therapy, is an increasingly popular holistic healing method used on pets and people. Simply put, it provides relief. 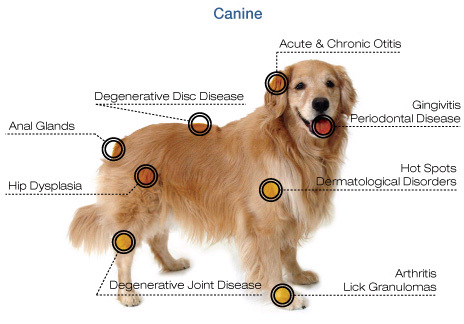 As the laser is administered, your pet will relax and enjoy, much like you, experiencing a good massage. The almost immediate relief of pain will allow your pet to be comfortable and any anxiety that your pet initially experienced will dissipate. Pain relief is provided in just a few minutes of therapy and that alone improves the quality of life for your best friend.